The stand is ready, the show can start. Poultry provides meat and eggs – and thus healthy and tasty food that is also affordable. When average household incomes increase, as they have in India in the past years, more and more consumers add high-protein poultry products to their diet. Considering the rapid population growth in India, one of the largest countries in the world (second only to China), these changing eating habits led to a remarkable upswing for the local poultry market. 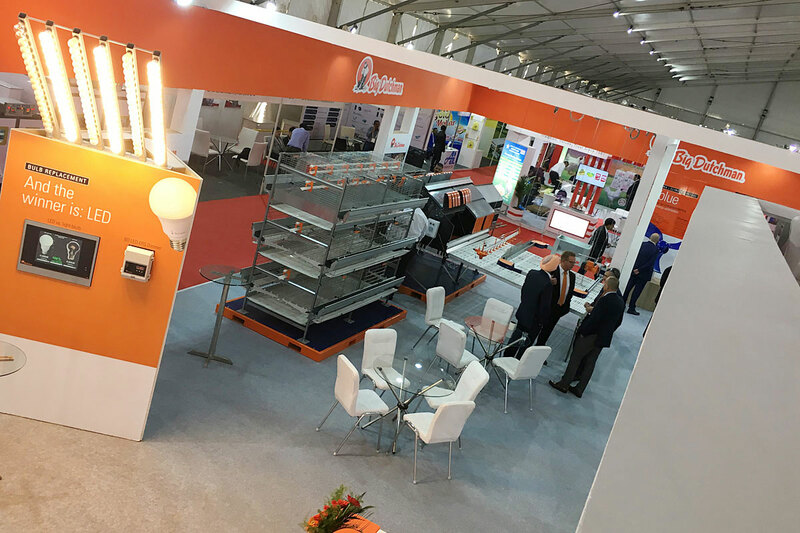 This development has not passed by Big Dutchman – and neither did the visitors of Poultry India 2017, the leading Indian trade fair on poultry production in Hyderabad, where the German poultry equipment supplier saw many visitors come and go on its stand packed with exhibits. Univent layer cage: For decades now, egg producers from all over the world have sworn by the Univent layer cages, and still do today. The Univent system is very popular because of its long service life and the ideal conditions it provides for both humans and birds. Some of its most successful features include the rugged Big Dutchman chain feeding system, the Galfan coating of all wire parts for a long service life and the fact that Univent can be equipped with manure belt ventilation. This means that poultry managers can significantly reduce the ammonia concentration in their houses. Relax group laying nest: This nest is particularly well suited for efficient floor management of broiler breeders. It is equipped with two separate, easy-to-lift nest roofs which significantly facilitates nest and egg belt inspection. Another feature is the egg belt with a three-point bearing design: thanks to the increased share of perforated surface and the triangular shape of the holes, contact surfaces between the eggs and the egg belt are minimised. Eggs that are rolling off are slowed down gently, which reduces the number of hair-cracked and dirty eggs. Poultry feeding systems: Big Dutchman’s feed pans for poultry growing and breeder management are very robust and ensure a reliable feed supply. FluxX 330 is just one example: the pan not only satisfies the needs of day-old chicks but also those of heavy birds in the final growing period. During the first few days of the growing period, when the feed line is lowered to the floor, the patented 360° flooding mechanism ensures an even supply of feed everywhere in the pan. This creates ideal starting conditions for the day-old chicks without any extra work. Solutions for a healthy environment inside the barn: Poultry keepers know that their birds can only stay healthy and exploit their full potential if the house climate meets their needs. In other words: fresh and exhaust air as well as heating and control units must match perfectly. Especially in the tropical and subtropical climate of the Indian subcontinent, a controlled house environment is a very important factor for success. Big Dutchman therefore offers various types of climate control systems: the range of products includes equipment for small farms as well as for large, fully-integrated farm complexes. 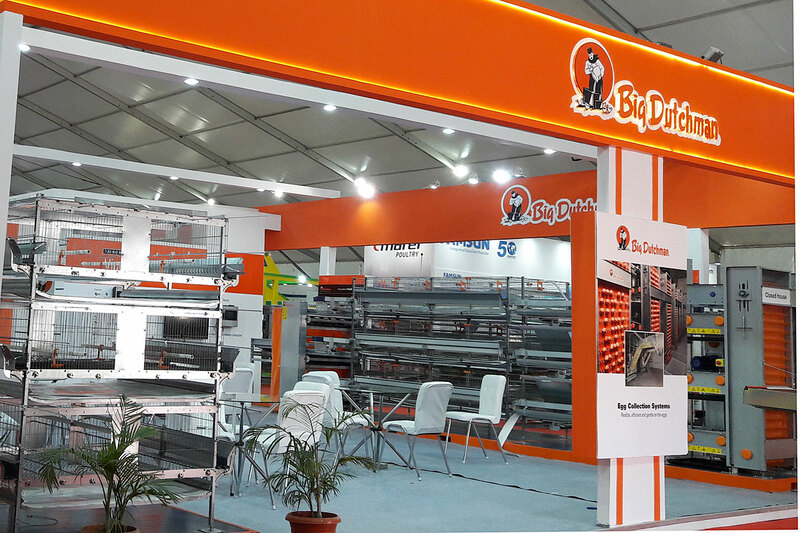 “The exhibits give a promising first impression of the Big Dutchman product range,” said visitors of the Big Dutchman stand of the products they saw. The entire product range is, of course, much more comprehensive. Celebrating its 80th anniversary this year, the world market leader’s product range includes virtually everything a poultry keeper needs to do his job successfully. The Big Dutchman history dates back to 1938, when the company founders invented the world’s first automatic chain feeder in the USA. Today, the company headquarters are located in Vechta-Calveslage, Germany. The innovative family enterprise’s range of products includes traditional and computer-controlled feeding systems as well as equipment for climate control and exhaust air treatment. The scope of services ranges from small to large, fully integrated turn-key farms. Big Dutchman provides customers with all options – from planning to commissioning. BD Agriculture India Pvt. Ltd.
As an alternative, poultry farmers can use an online form to get in touch. Egg producers go this way, meat producers kindly click here. The next exhibition is always just around the corner. Please save the date!